blast looking at the different sea creatures. But there are packages on currently on offer. As far as I can remember, we paid for Php 500.00 which includes Entrance to the Oceanarium, Fish Spa and The Jelly Fish Show. I was particularly interested with the Fish Spa, yes the word spa always ring my bell. 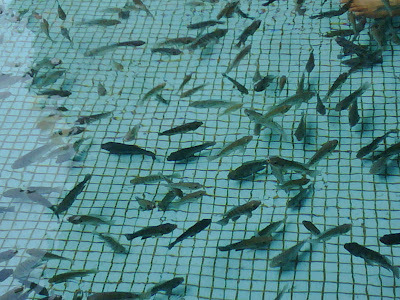 This is definitely a good way to pamper ourselves, instead of foot spa, why not try fish spa? But after I tried it, I will probably go back to my fave foot spa.. Mind you, its so ticklish while the fish nibbles the dead skin. I can not stand it longer than 3 minutes. Also, Christoph didnt stop complaining until I got up and washed my feet. He was so scared looking at the fish biting my feet.. poor kid! For more information, you may visit the webpage of Ocean Park here. I still prefer going to a real spa...not a fish spa...lol....nice experience though.